The appearance in Bus & Coach Buyer 1283 (4 July 2014) of a new contender on the British bus scene struck a chord with readers in New Zealand! Although the announcement of the manufacture of school and welfare bus bodywork on MAN TGL truck chassis by Nu-Track in Northern Ireland was of much interest, like votes for women, the splitting of the atom and ice-cream Pavlova, the Kiwis have done it first! There are already a number of front-engined MAN chassis in New Zealand that have received coachwork suitable for both school bus application and local private charter work, and our experience with these vehicles may be of some interest to B&CB readers. 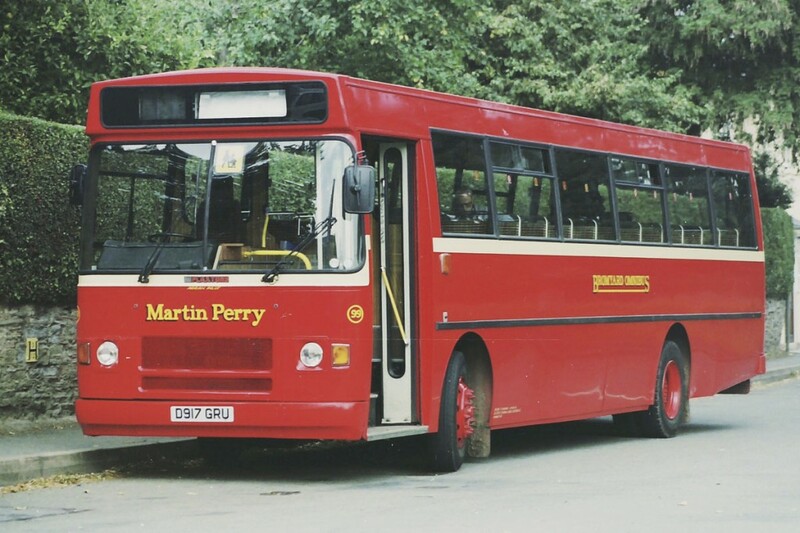 Despite being a right-hand-drive country with the majority of road rules, regulations and signage being based on the British system, the nation has a number of peculiar requirements for its bus and coach industry that set it apart from the rest of the world. The system of Operator-Licensing here is fairly simple, with no need for the evidence of financial standing, specialist operating centres or driver CPC’s that now beset the UK under the guise of ‘European’ legislation. However, to run a bus commercially there is a requirement for a competent operator to hold a Transport Service Licence (although there is no limit on the number of vehicles that can be owned or operated) and bus drivers need to hold a P-endorsement on their normal driving licence to be able to drive a passenger-carrying vehicle. Life for the driver is much easier, with no tachographs to worry about and a simple daily logbook in which to records driving and break periods. To own and operate a bus, gaining a TSL is a very simple process (done by applying to the New Zealand Transport Agency and paying a one-off fee) and once this has been obtained the operator is in business, subject to basic regulations that are enforced by NZ Police with roadside checks and the need to present each bus for a six-monthly ‘Certificate of Fitness’ at an approved vehicle testing station. 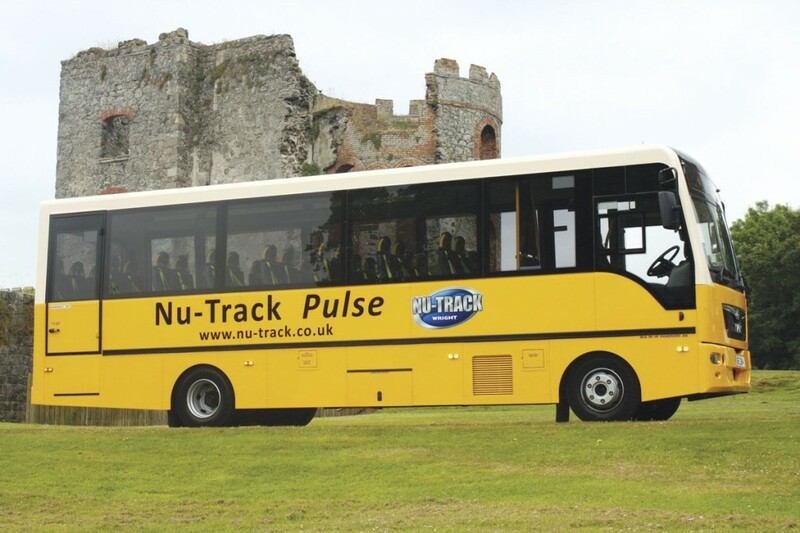 In New Zealand all buses are subject to ‘road user charges’ payable in advance in multiples of 1000 km, with the amount of RUC being assessed on the ‘kerb weight’ of the vehicle concerned. Mileages are recorded by a hub-meter on the rear drive axle of the bus, and the daily mileages are recorded by the driver in his log book. The initial certification of a vehicle to be used as a bus is subject to very stringent regulations relating to ‘rollover’ strength and also to axle loadings, and as a result of these New Zealand-specific rules, there is a ratio of seats to axle weights that must be complied with, meaning that any bus or coach needing to have a higher seating capacity against their gross vehicle weight is often required to run on three axles, a tag (or lazy) axle being the norm. A further regulation that affects school bus operators is a rolling 25-year age limit on school buses, and thus in 2014 any vehicle older than 1989 is now unable to see service on the school contracts administered nationally by the Department of Education. There is no legislation for seat belts on New Zealand school buses but all school buses have to display a prominent ‘School’ board when carrying passengers with the bus restricted to 80kph – also a mandatory 20kph speed limit is required of any vehicle passing (in either direction) a stationary school bus carrying an open ‘School’ board, and many rural roads have roadside warning signs advising all drivers that they are on a dedicated school bus route. The similarity of school bus provision in New Zealand to that in the UK is worthy of note, with individual routes to rural and qualifying urban schools being competitively tendered although contracts are awarded on a ‘dollars per kilometre’ basis rather than a set cash sum per route per school day, with contract periods being based on a six-year cycle but subject to a possible three-year extension. For the past 20+ years there has been a reliance on importing secondhand Japanese buses for use as rural school transport, but the rolling 25 year age limit combined with a ban (since 2009) on the import into New Zealand of diesel-engined vehicles that do not comply with at least Euro4 (from the original manufacturer so LEZ-type exhaust management add-ons are not permitted) and a consequent shortage of compliant Japanese vehicles plus ever-increasing costs has lead to a re-think in the sourcing of buses suitable for home-to-school transport (and indeed other bus requirements such as urban service vehicles). As a consequence operators have had to re-evaluate their sources of supply for new and replacement vehicles. The MAN brand has been prominent on the New Zealand bus and coach scene for the last couple of decades, with the manufacturer being a popular and significant chassis choice for new urban buses and to a lesser extent for coaches. 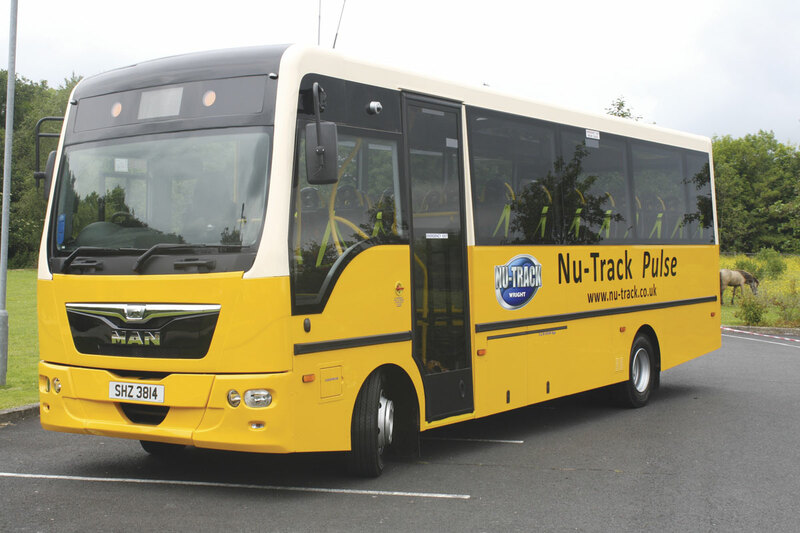 It is noteworthy that over 80 secondhand examples of the MAN 12.220 and 12.240 with MCV eVolution coachwork have been imported from the UK over the past two years, the majority being sourced and marketed by Associated Coach Sales from their North Island base in Palmerston North and proving to be a successful urban bus in many North and South island centres. It is no coincidence that one of the three leading coachbuilders in New Zealand, Coachwork Central, is also based in that city and, in a similar manner to the British Nu-track vehicle that has just been announced, a combination of MAN truck chassis and bespoke bus bodywork has been designed and built by Coachwork Central as an ideal answer to the problem of achieving a modern school bus at a cost-effective price and within the strict New Zealand perameters of axle loadings and their consequent effect on Road User Charges – a combination that, without being carefully calculated, can become a serious lifetime cost in the operation of an individual bus and hence a determining factor in the submission of a successful school contract tender bid. A recent very successful innovation has seen the importing from Great Britain by Associated Coach Sales (with the involvement in the UK of Bromyard-based UK Bus Dismantlers Ltd) of secondhand MAN TGL truck chassis which have been refurbished, modified and given new school bus bodywork at a very competitive and cost-effective price. To date a number of school coach bodies have been fitted to new MAN TGL chassis by Coachwork Central and branded as ‘Ranger’ bodies. 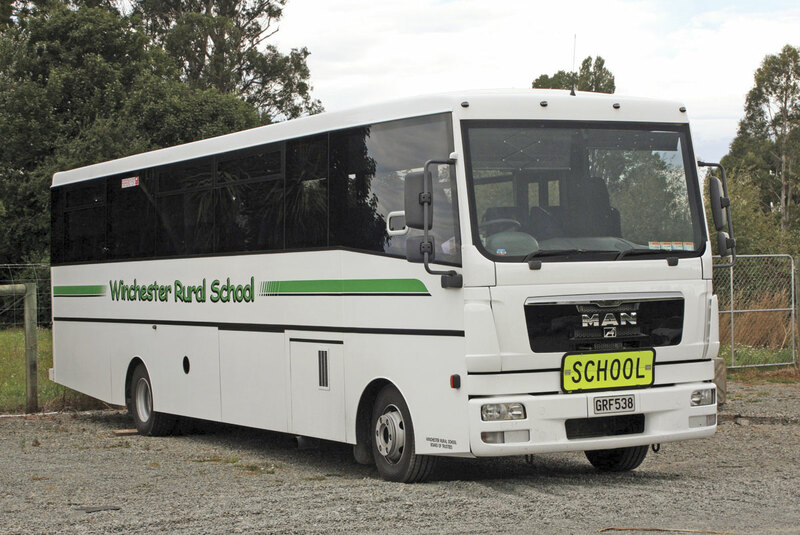 Two South Island operations that have taken advantage of new ‘Ranger’ school buses are Torlesse Travel from Darfield (to the west of Christchurch) and Winchester Rural School whose board of trustees operate two dedicated school buses to their village school. 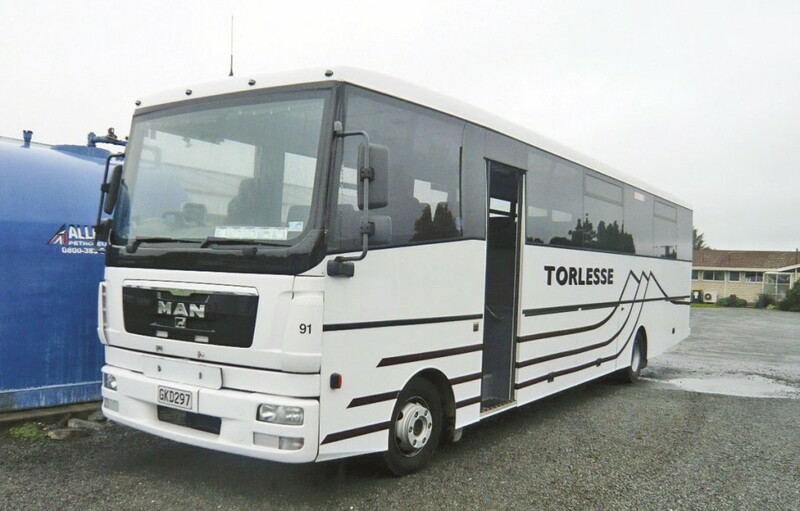 Torlesse have taken ten new buses – initially a pair of MAN TGL 10.210 Euro4 chassis with extended wheelbase to seat 48, and subsequently 8 Euro5 MAN 12.220 chassis. Winchester School opted for a 12.220 45-seater. 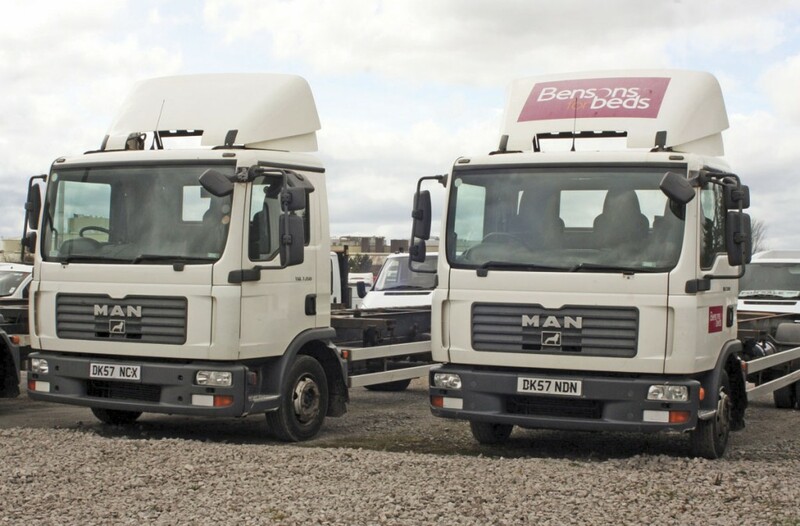 The secondhand ex-UK trucks (all 2008 models meeting Euro4) have been purchased and shipped as chassis-cabs, two having had previous lives on British roads carrying demountable bodies delivering Bensons Beds! 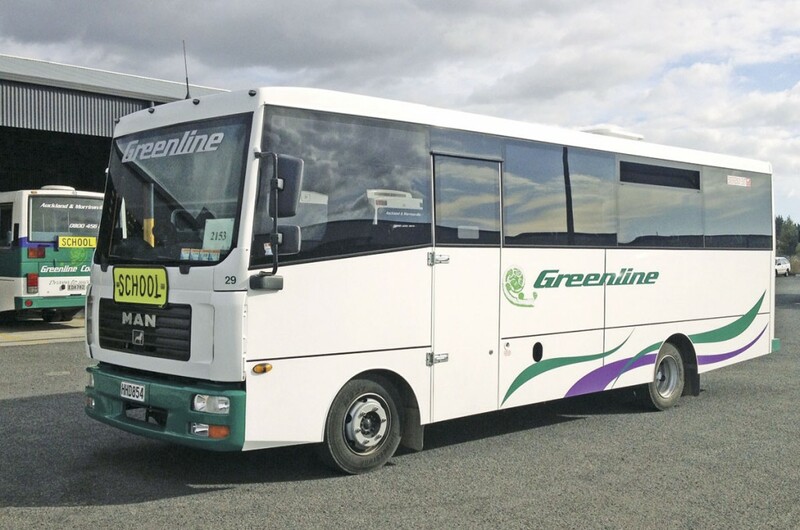 The first of these 7.150 chassis was shortened from 5.2m to 4.25m and received a 33-seat body for North Island operator, Greenline of Morrinsville. Currently in build at Coachwork is the second ‘Ranger’ on a refurbished ex-UK truck chassis, this one a TGL 8.180 on rear air suspension for a South Island operator. The specification on it will include 48 seats and Thermo King air conditioning. All of the Coachwork Central Ranger bodies feature the options of bus type or semi-coach seating (manufactured in New Zealand by Trimtech in Auckland) with the option of either an outward-opening power door or double jacknife doors and bonded, tinted side windows with hopper vents. Body construction uses a galvanised steel welded frame with either steel stretch panels or, for the Greenline bus, bonded aluminium side panels, each being completed with a fully moulded fibreglass rear panel with or without a rear window depending on operator preference. By retaining the chassis/scuttle that includes the smart and distinctive frontal ‘branding’ of the MAN truck, and joining this seamlessly to the new coachwork, a cohesive appearance is given to the outward appearance of these buses – a design that presents itself far better to the eye than other contenders for the Kiwi school bus market that literally attach a bus body behind a truck cab in a very ‘third world’ manner. The basic combination of front engine, door behind the front axle and proper bus appearance puts this writer in mind of a 21st century Bedford SB – despite the MAN TGL being very much a contemporary product with semi-auto transmission, ABS, electronic engine management and Euro-standard emissions, it still has the no-nonsense rugged simplicity of the Bedford SB, ideal for rural New Zealand where some school bus runs still use unsealed gravel roads. The Bedford analogy may not be as bizarre as might first be imagined – the SB was by far and away New Zealand’s most prolific bus with literally hundreds operating over three decades as a simple driver and passenger-friendly bus at home in both town and country. Just by following that basic philosophy alone, the new MAN ‘Ranger’ concept is assured of great success – and maybe British bus operators, as their Kiwi counterparts have already found, now also need a back-to-basics approach at a viable and competitive cost for a rural school bus that is smart and comfortable enough to double as a local private charter coach. This truck-based MAN concept definitely achieves this – and with New Zealand schools working on a four-term school year Kiwis really can happily claim that this bus is a MAN for all seasons!